Once the summer fades in Spain, Autumn arrives and brings a bumper crop of Spanish fruit. Seems like when you have fruit trees it seems that the whole crop comes at once. 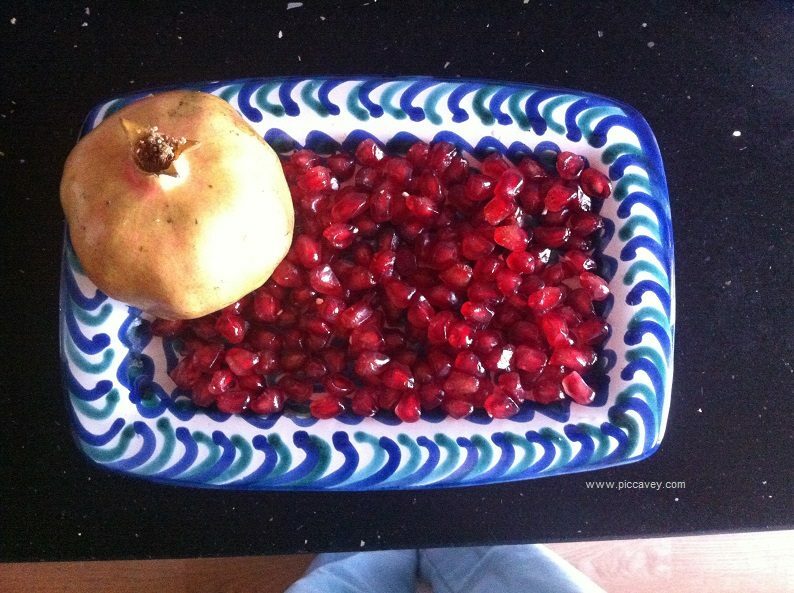 In late September and throughout October we are inundated with quince, avocadoes and pomegranates. Over the years I have learnt what to do with the surplus fruit in Granada province. Gathering some good recipes along the way. Including Tips on how to prepare it and what nutritional properties each one has. 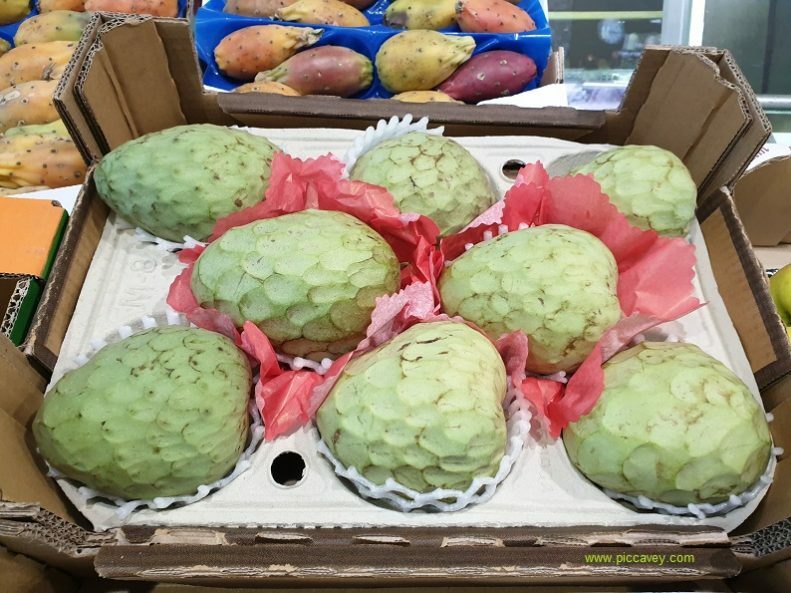 Appearance: It´s a large green tropical fruit. Inside it has white flesh and lots of shiny black seeds. It´s delicate and bruises easily and is in season in Autumn & Winter. 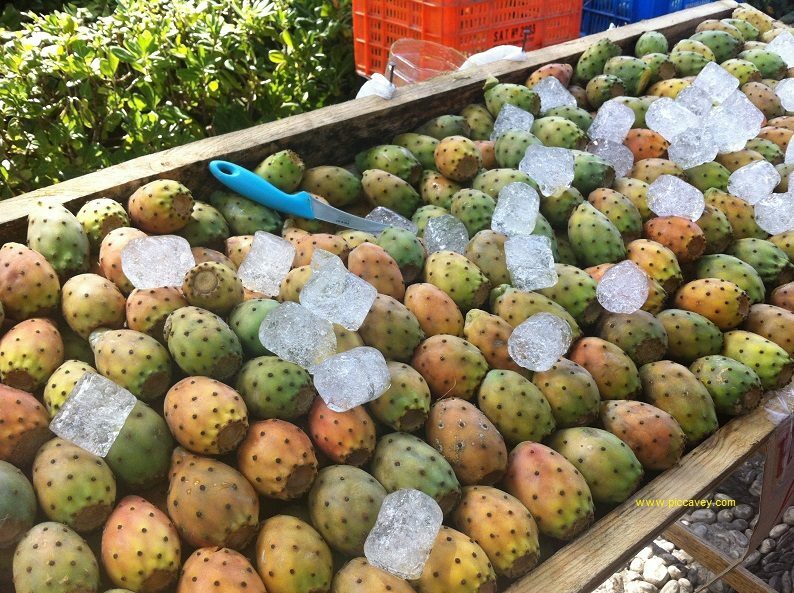 Chirimoya is grown locally on the Costa Tropical and in Granada. They produce 50 million kilos every year. How to eat it: Slice in half and eat with a spoon, avoiding the large black seeds. When overripe they are not very good. Great for smoothies. Locally there is a craft beer made with Chirimoya as an ingredient, brewed by Cervezas Nazari. Good for: Chirimoya have 75% water content and contain vitamin A & C. They also have potassium and antioxidants too. Recommended for constipation, to reduce stress and are said to be good for skin, teeth and bones too. Some say that the properties of the Chirimoya act in a smiliar way to aspirin. Appearance: This is a large orange or red fruit with a thick skin. Full of bright red seeds inside it´s in season from October to February. How to eat: Slice off the top and bottom then break it into 2 halves. Scoop out the seeds and eat them. (See video below) Careful with the red juice, as the stains are really difficult to get out. Eat the seeds alone or make juice from them. Also you can add them into yoghurt or top a salad with them. Good for: They could help to avoid plaque building up on teeth and may even help to reduce blood pressure. 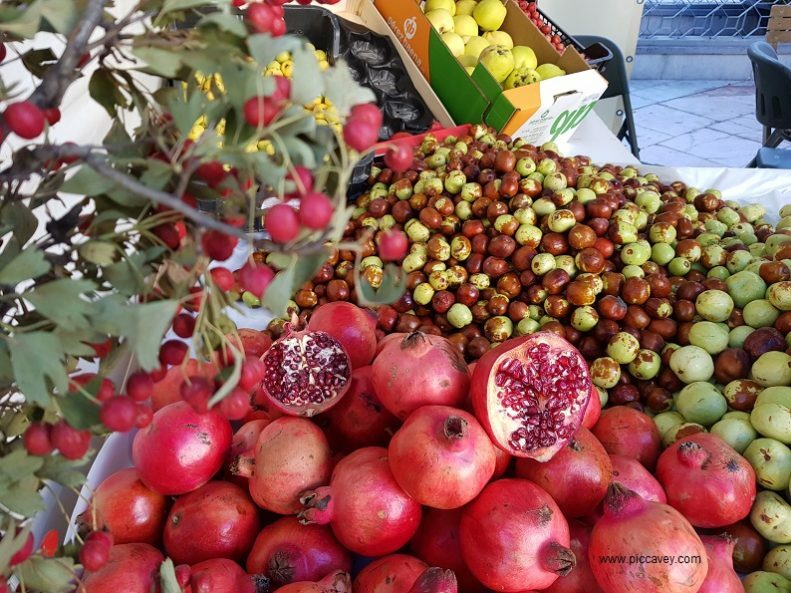 Pomegranates are packed with antioxidants and high in fibre too. The name of the city of Granada means pomegranate. You will see this symbol all around the city. Appearance: Caquis can be pale yellowey orange to deep red color. They look like tomatoes. In Spain they are in season in Autumn. 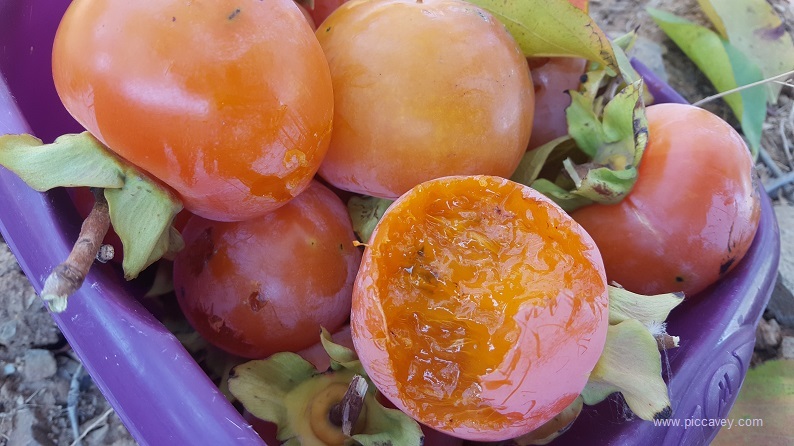 How to eat: With a very ripe Caqui fruit (Hachiya) just lift skin and eat with a spoon. The pulp is almost liquid, like jam and has a very sweet taste. Unriped sharon fruit (Fuyu) can be ripened by storing in a container with alchol, such as aniseed liquor. The astrigent nature of unripe Sharon fruit is quite unpleasant so it best to try these fruits when ripe. Good for: High in fibre and rich in vitamin C.
They have a wonderful colour and flavour. Be careful not to stain your clothing as it´s very difficult to remove. How to eat: Great to make jams and jellies as they are high in pectin. They can be used with apples in crumbles and baking to enhance the flavour. 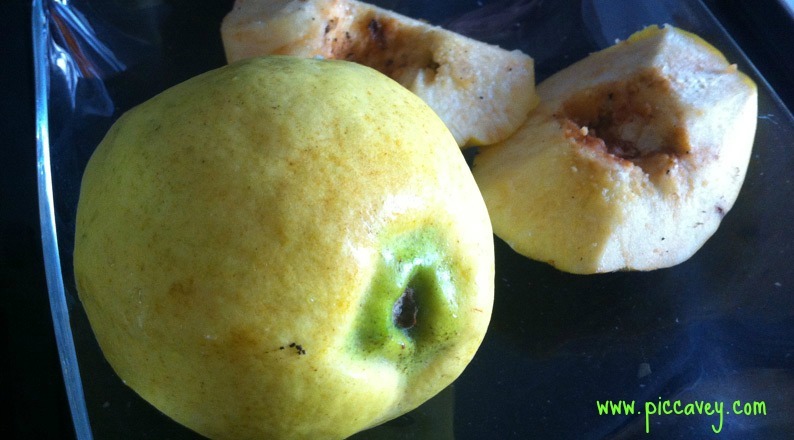 Quince can be roasted in the oven or boiled with cinnamon for a winter dessert. They also have a pleasant perfume that fragrances your home. 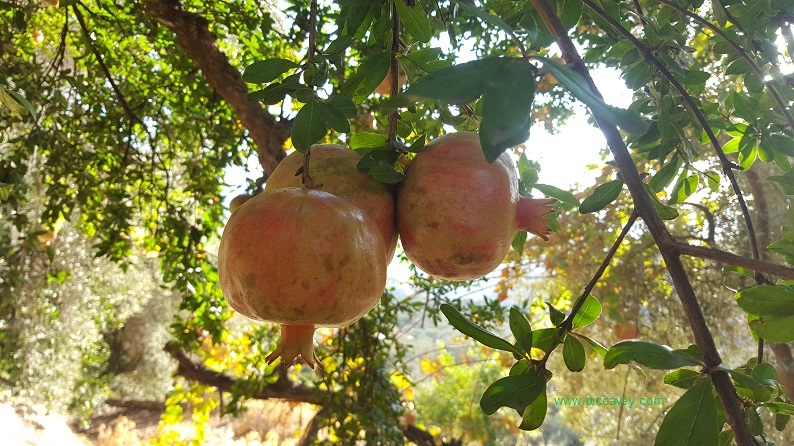 They are grown locally in Granada province and other areas of Andalusia. How to eat: See how to prepare them in the video below. Once peeled eat cold from the fridge or use in smoothies. The cactus plant that bears these fruits has lots of fine needles. Also found on the fruit, they are fine and invisible. You must wear thick gloves to pick them and use metal tongs to pull them off the plant to avoid getting these painful cactus spikes in your hands. Once they are peeled the fruit inside of course is spike free. You may see street sellers with Chumbo stalls in Septemebr and October. They have done all the hard work removing the spikes. Good for: They contain magnesium and potassium. 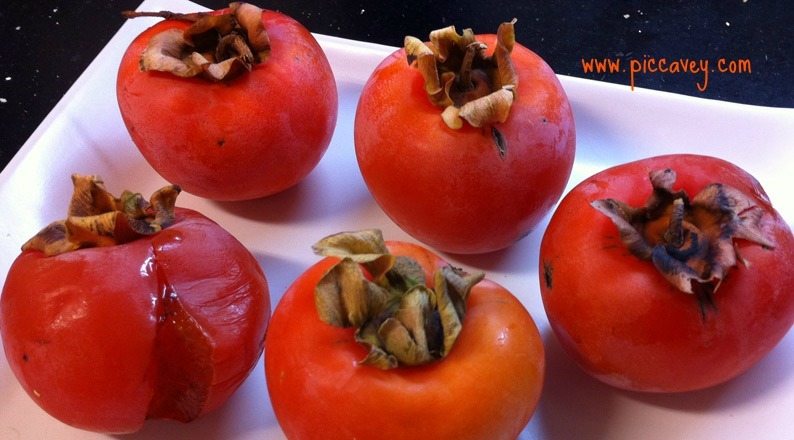 What is a Medlar fruit? Appearance: Small Brown fruit with long sepals, soft pulp inside, similar taste to apple puree. How to eat: Chop off the top and eat the rest. These remind me of crab apples and are in season in wintertime. Once picked from the small tree if must be eaten within one or two days. It doesnt last long. Good for: Rich in Pectin and Vitamin B & C, years ago it was a home remedy to help combat diarrhoea in children. How to eat: Eat alone but be careful with the stone in the centre. Although only a short shelf life, once picked only last 4-5 days. Appearance: An oval shaped fruit with green shiny skin. The flesh on the inside is pale green and has a butter like consistency when ripe. In season from November to January. 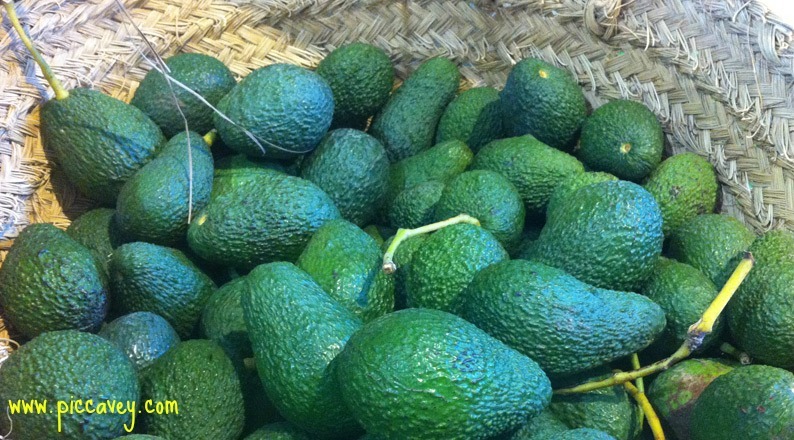 In Granada province on the Costa Tropical 20 million kilos of avocados are produced each year. How to eat: Apart from making guacamole avocadoes are also lovely in salads. Spreading avocado on toast is also a great way to liven up breakfast. Recipe: Choose a ripe avocado and slice it in half. The stone should come out easily. Fill the hole with balsamic vinegar and salt. Eat with spoon. Oranges and lemons are plentiful around the South of Spain. Probably the Spanish fruit most associated with Spain, these citrus fruits have a very long shelf life and store well. When they are in season (Winter and Spring) I use them for eating and for a daily juice every morning. Perhaps you have surplus oranges which you can make marmalade with. Street oranges: In Seville Granada and other Andalusian cities you will see Orange trees lining city streets. Although these oranges are eyecatching they cannot be eaten. Beacause these trees are so decorative you will see lots of them. Don´t be fooled by the colourful fruit. They are not for eating, just for show. 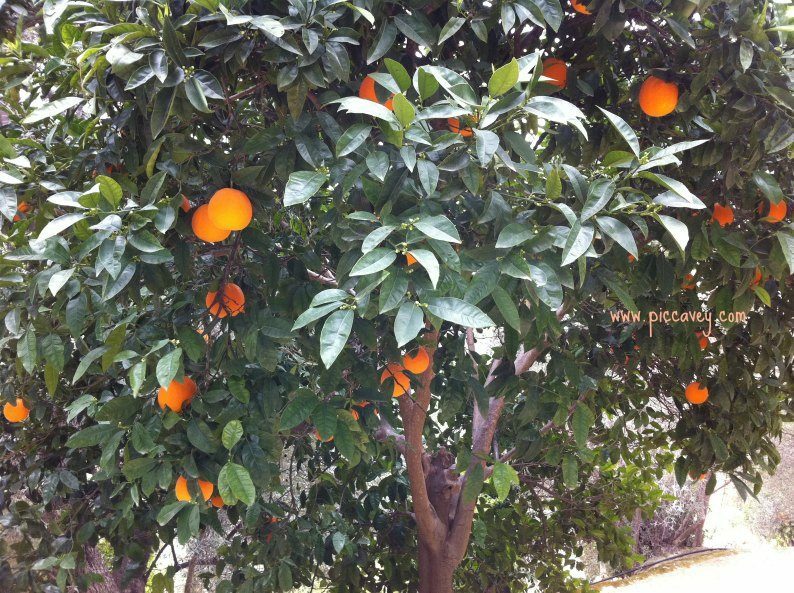 Varieties grown for table oranges, for juice or even mandarin oranges are different plants. So dont be tempted to eat one of these street oranges as the taste is quite bitter. Of all of the fruits I get straight from the campo I don´t seem to have a favourite. Each one of them goes with that time of year. There´s nothing better than a cold chumbo on a hot august day. The sheer joy is having a different fruit each season and revel in the variety of them all. 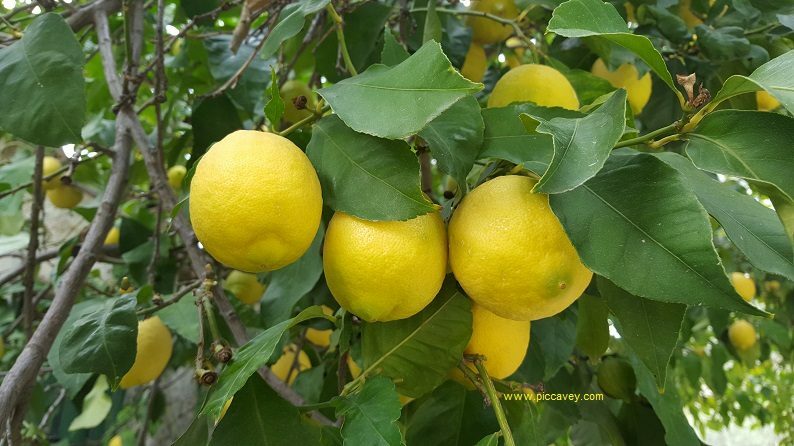 Do you have lots of surplus fruit from your garden or trees? 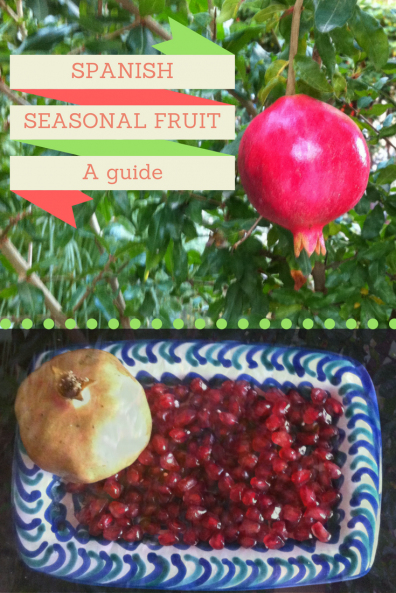 Let me know your Spanish Fruit tricks and seasonal recipes too. Thanks for including a link to my recipes, Molly – I hope your readers find them useful! If you have too much fruit all at the same time, Jam is the way to go Sue! Great post. Didn’t know about higo chumbo. No wonder nobody has understood me as I have always used the word I learned in Argentina for it – TUNA! 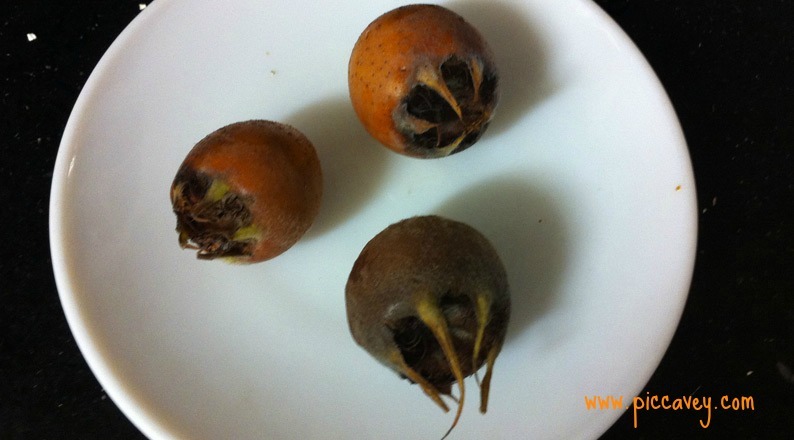 The problem with medlars is that you have to get them almost to rotting state before you eat them – not visually appealing! And a favourite way for me with avocados is stuffed with a salsa type mix and cheesy sauce – delicious! Thanks for the Avocado tip. Yes medlars don´t look too pretty but the taste is good..
Are there more tropical fruit in Spain, like lychees, longans, sapotas, guavas, etc.? Hi, On the Costa Tropical (south of Granada) Mangoes, Papayas, Bananas and Custard Apple, known as Chirimoya are grown. They could potentially grown other tropical fruit due to the climate but at the moment they don´t grow these fruits as far as I know. I truly love mangoes and previously my favourite mangoes were from the Philippines. However, I must state that the tastiest mangoes I have ever tasted were locally grown in or around Nerja on the Eastern Costa del Sol. Admittedly they are not the largest fruits in the world, but the taste is without equal anywhere else. Do not buy in a supermarket. In season, many local households offer mangoes grown in their nearby country cottages for sale in their doorway. This is the best place to buy good and tasty mangoes. I believe the peak season is around September and October. 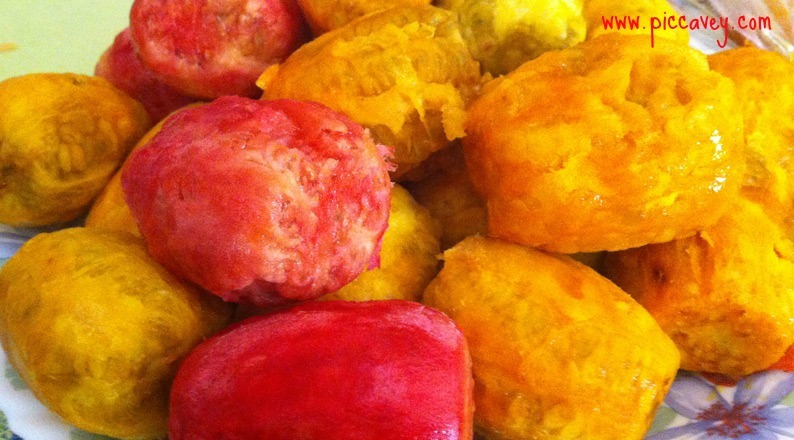 Do try a local mango from Nerja – it is the most delicious experience! Thank you for a very useful guide. I saw chirimoyas in the supermarket yesterday and didn’t have a clue what they were! Have also previously seen prickly pears but avoided them as I didn’t know what to do with them. Prickly pears in the supermarket generally have the spines already taken off. But if you pick them yourselves be very careful. Love the pomegranate video! That is so much easier than the way I’ve been doing it. The Granada pomegranates have started making their way into the Valencia markets in the last few weeks, so I’m stocking up. Thanks for this! Someone just arrived with a sackful of pomegranates (love em) and an unidentified fruit. From your description, I can say they are medlars. They are mushy and sweet. But, you don’t mention that they stink! 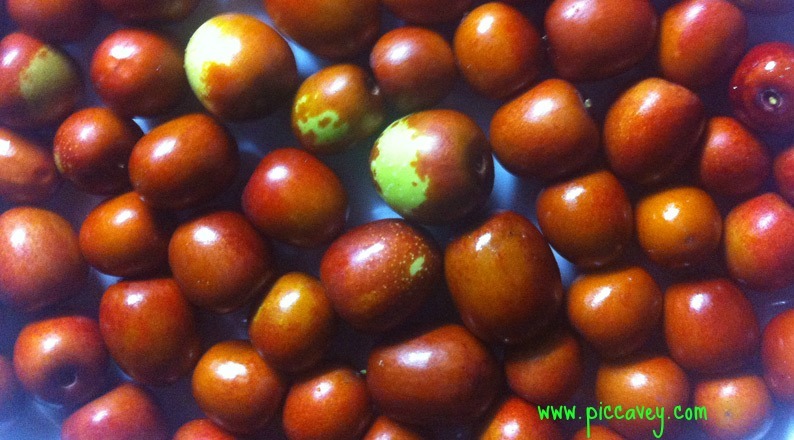 The nispero de invierno fruit are delicate, they are like apple puree inside. So yes, if they get too ripe or squashed it can be messy. Shelf life is very short. Great guide! I was wondering what some of these were and how to eat them. Here’s my preferred method of opening a pomegranate. I find your Spanish blog very resourceful! How do you rate visiting southern Spain in the months of November through February? We’re planning on a trip with three kids under the age of 11. Also, in terms of days needed to fully capture the main attractions and travel time between cities, how many weeks do you recommend? If you could have an itinerary of 8-10 days that would be ideal. The main cities with historic monuments and places with a large cultural offer would be Cadiz, Seville, Granada and Cordoba. Perhaps arriving at Malaga stay over for one night then followed by transfer to Cadiz, 2 nights there, then 2 nights in Seville, 2 in Granada and 1 in Cordoba before returning. If you have additional nights I would suggest adding an extra overnight in Malaga or Granada. In Seville the historic city can easily fill two days. Cordoba the historic city and Mosque of Cordoba require a full day with an overnight stay recommended. The Medina Azahara site (short bus ride) is also highly recommended too. We are hoping to travel to Barcelona during last week of October. Are there any fruit growing areas near Barcelona? We would like to visit one. The agricultural areas are around Vic and Girona countryside. Why is Spanish flour so different to English flour? We do not like the dark chocolate which they use in Spain on cakes + drinks as its so dark and bitter. Their way of life is so good for old age. Early rise, sleep in the afternoon, have supper when you feel like it. It is just what the doctor ordered. We love to be in Spain 6 months of the year and go back to our 2 bed house in England. but all in all Spanish house a lot cheaper to run than English homes RATES are 3 times more in England and taxes you come to realise were your money goes when you go to another country. For baking in Spain, when I want to make an english recipe I use Self Raising Flour which I buy at Carrefour. Ths Spanish flour is to be used along with Baking Powder to make cakes, or some also one called MAIZENA which is Cornflour. I use a Mexican method with prickly pears. take a large leaf, or more likely to hand some thin cardboard or an empty sardine tin box, pick up the fruit with it, and using a knife postion so that just one end sticks out. Cut off that end, and squeeze into the other palm or a bowl/plate. Eat. I also did a youtube video of this some years back, but it’s a palava to search for it now. Thats a good tip, thanks for sharing with us!